With a stay at Plaza Osaka, you'll be centrally located in Osaka, within a 10-minute drive of Umeda Sky Building and Floating Garden Observatory. Featured amenities include express check-in, express check-out, and dry cleaning/laundry services. Planning an event in Osaka? 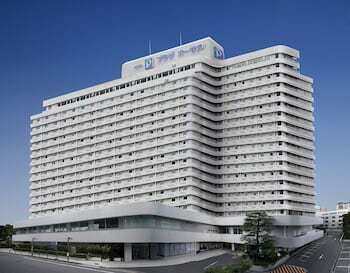 This hotel has facilities measuring 1940 square feet (485 square meters), including meeting rooms. Self parking (subject to charges) is available onsite. With a stay at Le Port Sanuki in Takamatsu, you'll be within a 5-minute walk of I Love Yu and Benesse House. The front desk is staffed during limited hours. Free self parking is available onsite. With a stay at Matsunoyu in Matsue, you'll be a 1-minute walk from Tamatsukuri Hot Spring and 7 minutes by foot from Tamatsukuriyu Shrine. With a stay at Kashiwaya in Nikko, you'll be within a 15-minute drive of Kawaji Onsen and Kinugawa Onsen. Free self parking is available onsite. With a stay at BaseInn Komagome Tokyo in Tokyo (Toshima), you'll be within a 15-minute drive of Ueno Park and Tokyo National Museum.